When I was 6, I went to the State Library of NSW for a school visit, returned home and told my father that when I grew up I was going to work and sleep there amongst the stack rows. Ten years later, I would study at the awe-inspiring Mitchell Library, back in the day when anyone could climb the stairs and access the books. My favourite, dream-like study spot was in front of the 938’s, from memory, it was up one flight of stairs on the right hand side. Now, I am a librarian but I have yet to sleep in a library let alone the State Library (though, funnily enough, I have managed to lock a borrower in the library overnight but that is another story). My own home is full of books and there isn’t a single room that doesn’t have bookshelves – including the bathroom and laundry. Which has brought me to dream of 1 bookshelf. 1 floor-to-ceiling bookshelf, 1 floor-to-ceiling, need-a-ladder-to-reach-the-top, kickass bookshelf. Books tell of the person, their storage/presentation tells of their asthetic. I also loved stay at a school friend’s house – a camp bed in a room completed decked out in bookshelves. My now adult recollection is that it was floor to picture rail. I think it was predominately her father’s collection and had politics, economics and loads of theology. I don;t remember where in the house the books of the children were present – I am sure they were, but that room just overwhelms me. Wouldn’t that be fabulous! Floor to ceiling, a ladder, a house big enough to fit them in! The shelves are being planned. And though I am ambivalent about the cost, I know that I will regret it if I don’t custom make them. I will keep you posted. Oh yes! 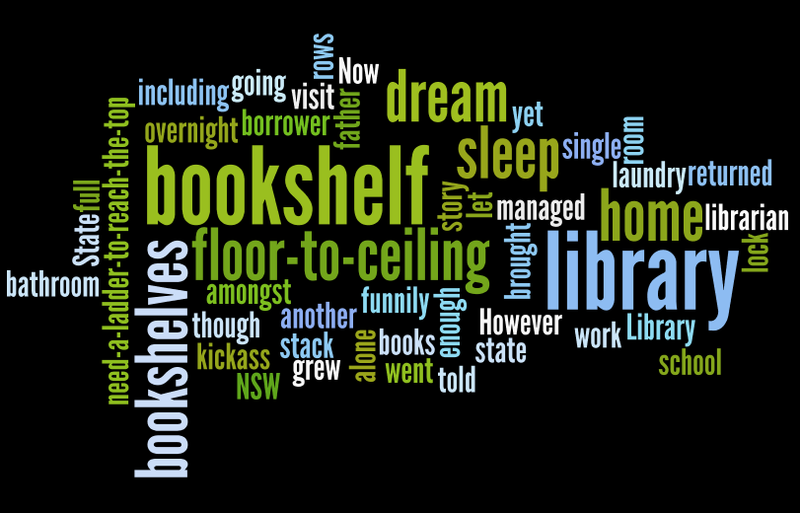 I am dreaming of big bookshelves too. I thought maybe on the stairs. It will be so great to get rid of the rag tag collection of bookshelves. Our old house was like yours – bookshelves crammed into every spare corner.